A very interesting post combines the idea of social CRM to communicate to customers, and Adaptive Case Management (ACM) for continual improvement within the enterprise, to for a compelling vision for the enterprise of the future. This is similarly a representation of “Agile Business” which is a business that is able to monitor its effectiveness, and quickly modify behavior to meet the needs of the market. Agililty has been the goal of business for a long time, and it seems that “social networking” is a new way to help achieve this. A social business maturity model – he outlines four dimensions along which we can measure the amount of adoption of social techniques, (culture, organizational approach, customer involvement, and social technology) and five steps along those dimensions that take an organization from island, to membrane, to channel, to social CRM and ultimately to social business. As more companies begin to be interested or in some cases to effectively launch new initiatives for involving customers and employees to improve their business, a possible sequence of cultural, technological, organizational maturity stages starts to show up. Very interesting; looking forward to future posts in there. This entry was posted in Adaptive Case Management, Social Business, Social Network and tagged Adaptive, Adaptive Case Management, Agile, social software. Bookmark the permalink. I’m simply flattered to be part of your posts. I’m reading Mastering the Unpredictable and trying to catch up with all the great material you and the ACM community has been sharing. I believe what is really needed is breaking down silos and creating a common ground among a bunch of different domains like ACM, Social CRM, Social PLM, Social ERP. While Social Business is starting to be the umbrella term under which many of these discussions are coming together, many more (especially not technological) central pieces are still in their infancy like new management paradigms, open leadership, employee empowerment and customer engagement. Would love to talk more about this bigger picture and to bring some of these insights at next year Social Business Forum (4th edition of the International Forum on Enterprise 2.0, see http://www.enterprise2forum.it/en) we’ll be organizing in Milan. Yes, a lot will change in the company of the future. The waterfall model for product develoment is like stone age. 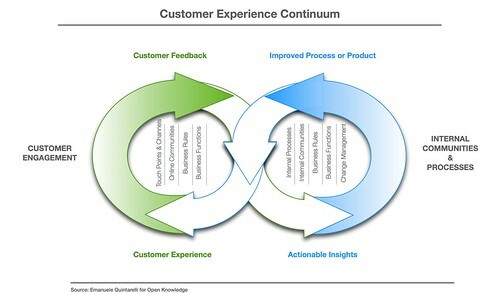 Knowledge workers in develoment will increasingly profit from direct customer feedback. On the other hand, it is obvious, that including customer feedback into product planning – even if it is no waterfall model – will still be challenging, because it is clear, that there are irreducible complex units of work, that can only be done as a whole or not (because if they are done half, they cause more harm than improve anything). And there are dependencies. Understanding and judging all of these constraints is and will be the task of the knowledge worker. And ACM in product develoment combined with CRM is definitely a big application area.